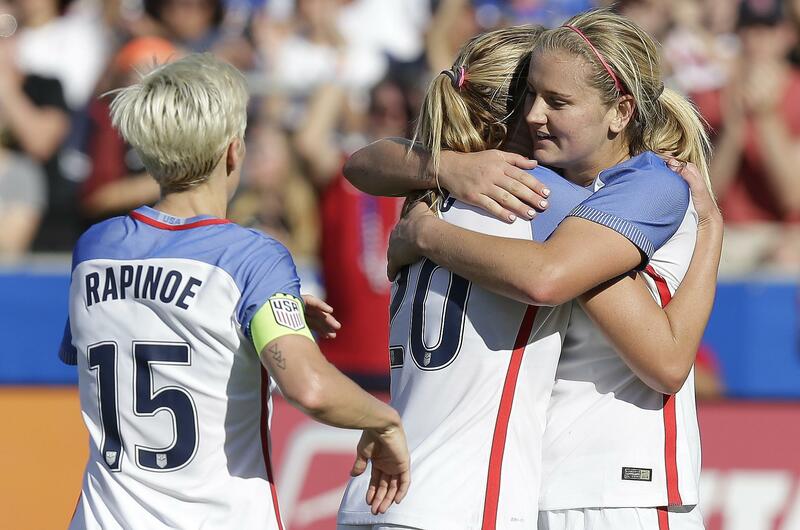 Sun., Oct. 22, 2017, 5:38 p.m.
CARY, N.C. – Sam Mewis scored a pair of goals in the first half and the United States went on to beat South Korea 6-0 in an exhibition match Sunday. Christen Press and Julie Ertz also scored as the national team built a 4-0 first-half lead. Lynn Williams and Allie Long added goals in the second half. Mewis, who plays for the National Women’s Soccer League’s North Carolina Courage, was playing in front of the home fans at Sahlen’s Stadium at WakeMed Soccer Park. Announced attendance was 9,727. Mewis’ goals came in the third and 20th minutes. Press added her goal in the 35th before Ertz scored on a set piece in first-half stoppage time. Williams, who also plays for the Courage, scored in the 61st minute before Long’s final goal in the 83rd. The game was also marked by the number of high-profile absences for the United States. Mallory Pugh injured her hamstring during a 3-1 victory over South Korea in the opening game of the exhibition series, played Thursday in New Orleans. She did not go with the team to North Carolina. The United States was also missing Tobin Heath (ankle) and Taylor Smith (shoulder). Both were injured in the NWSL title game between the Portland Thorns and the Courage. The Thorns won the title with a 1-0 victory over North Carolina. As a result of the absences, coach Jill Ellis called in midfielder McCall Zerboni, who also plays for the Courage. The 30-year-old came in as a sub, marking her first-ever appearance for the national team. The U.S. women will wrap up the year with two exhibition games against Canada next month. These matches have largely served as a chance for coach Jill Ellis to evaluate players going into World Cup qualifying next year. Published: Oct. 22, 2017, 5:38 p.m.